I’m straight outta re-hab, trying to dry out, (massive weight gain, gotta take up smoking – Hey, apparently it’s better for you). We were going to travel down on the (Supergrass fashion) Raleigh Chopper, (but as the warning says, the seat isn’t suitable for more than one passenger- especially one so fat!). So the Fatmobile, dually summoned, (picking up a vagrant/fragrant Danny Crud, on the way), pulls into the quaint Victorian seaside town. With a Crudcrew Dublin Cruise on the cards tomorrow, (&, of course the new me” taking each day as it comes” regime), tonight starts with a shout to the bar to Carl Gintis…he hides…again. The Cathy Davey support ‘no show’ has Agent Apple reeling, and he wants to go home! Onstage, 22-20’s quickly changed his mind… they open strong, with a mixture of N.Y.C. sleaze, & home-grown melodic dirge, drawing various reactions (&) comparisons to MC5, 80’s Matchbox & at times The Stooges, albeit a crisper sound (in this venue, THAT works wonders). ………She first heard Supergrass in the womb, when, Dawn (Mrs Fatman) was 8 months pregnant in Manchester Academy…”When you are older, Elise….”. Now aged four, she came right back with “I don’t want to get bigger, I have fun now”. 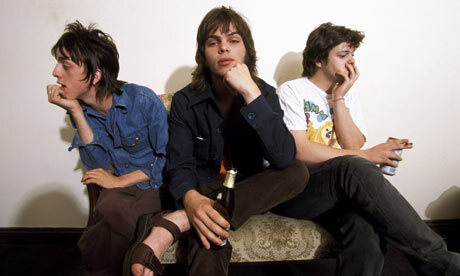 Summing up Supergrass, better than this review will ever do.